Filed under: Featured , Featured Videos , News , UFC , Videos BRASILIA, Brazil – Before Cristiane Justino and Lina Lansberg square off in Saturday’s UFC Fight Night 95 headliner, there’s still one obstacle standing in the way: the scale. Lansberg (6-1 MMA, 0-0 UFC) is, of course, aware of Justino’s (16-1 MMA, 1-0 UFC) very public weight struggles. But, as much as she can understand them, she is not about to grant her opponent any extra pounds. 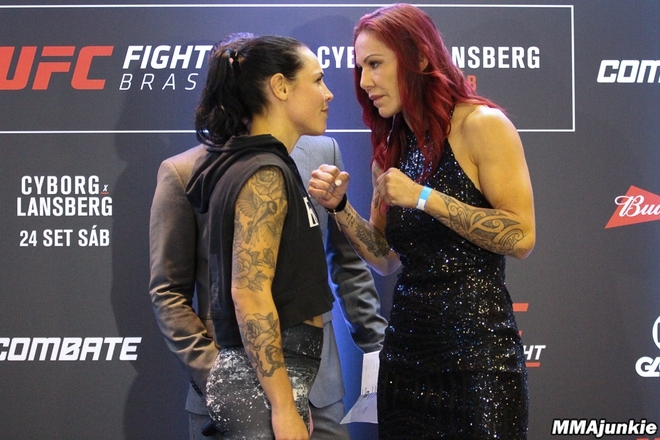 If “Cyborg” misses their 140-pound catchweight limit, Lansberg said, Saturday’s current headliner is most likely off. “We are both professionals and we have signed a contract at 140 pounds,” Lansberg told MMAjunkie during today’s official media day. “And she has already been given 140 instead of 135, and we all have to remember the UFC weight is 135, and she’s the only one fighting above it.